I am in a new family with my husband and step-son. Before this family, I don’t even remember if there was a time as an adult that I bought and decorated a Christmas tree. This was always something that was special to me in my parent’s house and I continued to collect ornaments all those years, but it wasn’t until four years ago that I started decorating a tree as a new family event. As a couple, we’ve started collecting ornaments when we travel and to remember special events in our lives, and it’s turned out to be a really fun way to decorate our tree. 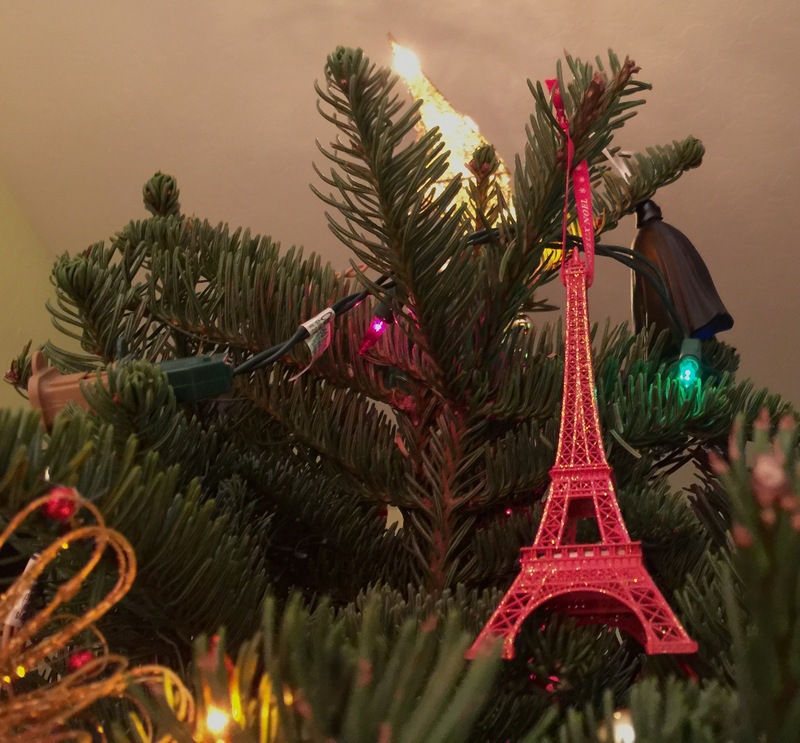 From our honeymoon, we have the Eiffel tower, a scene from Eze, France and Monaco hanging on our tree. We have the Seattle Space Needle, a lighthouse with Santa from New Hampshire and a cute Hallmark ornament symbolizing the purchase of our home in 2013. 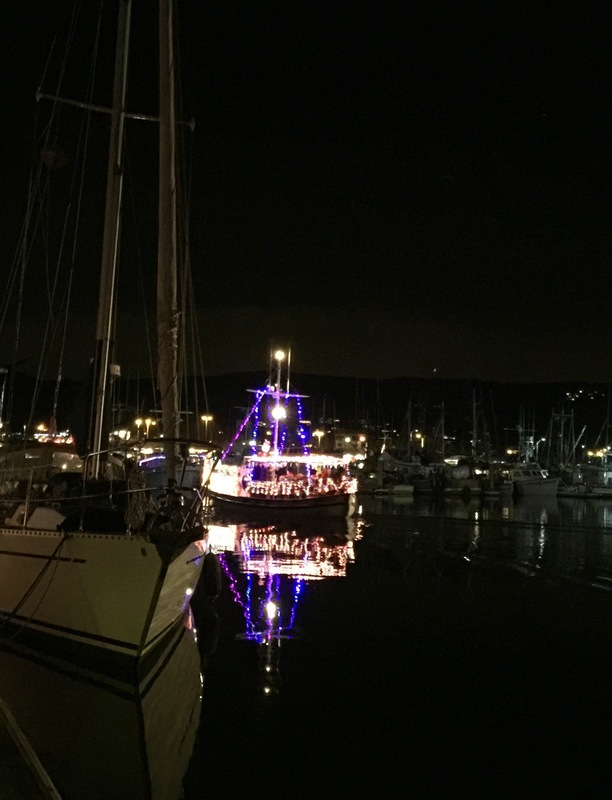 Last year, we discovered a local holiday community event – A Boat and Light show at our nearby harbor. I decided this would be our new family holiday tradition. Boats were decorated in Christmas lights; there were lots of Santa hats, a large illuminated Rudolph and even someone dressed up as Bumble. Dogs were out and about, some of them dressed up too. Boat owners handed out cookies, hot chocolate, and other “special” drinks. There was even a boat with Christmas Carol Karaoke where every participant got to walk away with free crab. After experiencing one of my favorite Christmas events ever, this had to be our new tradition! This year, I made sure all of our calendars were cleared so that we could go again. Then an undesirable holiday tradition swooped in and I quickly realized I had the flu. My very own Grinch was holding me hostage and taking away the joy of Christmas. I was in bed the entire day leading up to the event. I kept thinking that maybe if I stayed there all day, I would have the strength to go out and see the lights reflecting off the water and enjoy the holiday buzz. My plan didn’t work so well and I had to admit that I was still in the midst of a viral takeover. However, I thought if I could just get over there for thirty minutes and get some fresh air and see some of the event, then I would feel like our new tradition still existed. I bundled up, even though I was too hot with a fever and felt like shorts and a t-shirt would have been more appropriate, and we headed out. As the event followed the West Coast Stormageddon’14, the show was a lot quieter this year, but I was very happy that we made it. My husband had to stay close to me to ensure I didn’t fall over into the water or face-plant on the docks in my flu-fever stupor, but the three of us were a team and while they held me up with the flu, we held on to our new holiday tradition.